Henri Matisse was a French artist who lived from 1869-1954, and was a friend, contemporary and artistic rival of Pablo Picasso. 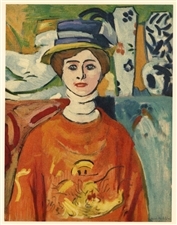 Henri Matisse artwork is best known for expressive use of colors and his unparalleled drawing and drafting skills. 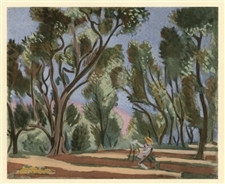 During the middle twentieth century he advanced several new printmaking and engraving techniques. 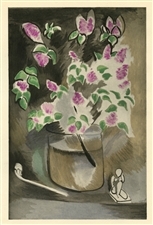 Henri Matisse artwork is recognized on sight by many and is highly collectible work. We offer an extensive collection of Matisse prints, Henri Matisse lithograph originals and also some rare Matisse pochoirs (after the paintings). 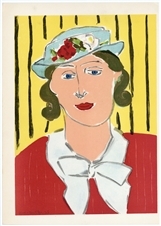 We even have some original linoleum cut (linocut) pieces created using a technique pioneered by Matisse. 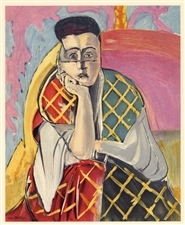 Here at AffordableArt101 you'll find the best selection and lowest price on Matisse art prints. Thank you for looking and please enjoy the art! Henri Matisse lithograph for Verve "Icarus"
Medium: lithograph (after the découpage). 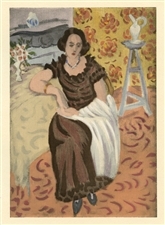 Matisse executed this composition in 1945 especially for the front cover of Verve (Volume IV, No. 13) -- the rare "De la Couleur" issue. Size: 13 1/2 x 10 1/8 inches (358 x 258 mm). Not signed. Condition: this was the actual cover -- there is some wear and the edges of the sheet have been trimmed on all sides. There is another lithograph printed on back with some offsetting from this showing through to the front. Henri Matisse original lithograph "Fruits"
Medium: original lithograph. Printed in 1964 by Mourlot, in a limited edition of 2000 on Arches wove paper. Sheet size: 10 x 7 1/2 inches; image size 6 x 4 1/2 inches (150 x 110mm). This original Matisse stone lithograph is from the scarce and lavishly-produced limited edition catalogue, "Prints from the Mourlot Press". Published in 1964 by Mourlot on the occasion of their landmark traveling exhibition, which was sponsored by the French Embassy and The Smithsonian. The word "Catalogue" is printed in the margin beneath the image, as published. Not signed. 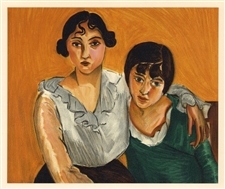 Henri Matisse lithograph "The Two Sisters"
Medium: lithograph (after the painting). Printed in Paris on smooth wove paper at the atelier Mourlot and published in 1954. Size: 6 1/2 x 8 inches. Not signed. 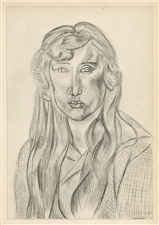 Henri Matisse lithograph "Madame Greta Prozor"
Medium: lithograph (after the painting). Printed in Paris on smooth wove paper at the atelier Mourlot and published in 1954. Size: 9 1/2 x 6 inches. Not signed. 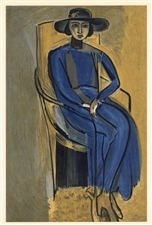 Henri Matisse lithograph "Woman with Veil"
Medium: lithograph (after the painting). Printed in Paris on smooth wove paper at the atelier Mourlot and published in 1954. Size: 9 x 7 1/4 inches. Signed in the plate (not by hand). 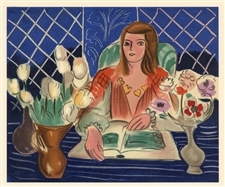 Henri Matisse lithograph "Annelies with Tulips and Anemones"
Medium: lithograph (after the painting). Printed in Paris on smooth wove paper at the atelier Mourlot and published in 1954. Size: 6 1/2 x 7 3/4 inches. Signed in the plate (not by hand). 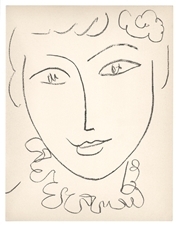 Henri Matisse lithograph "Girl with Green Eyes"
Medium: lithograph (after the painting). Printed in Paris on smooth wove paper at the atelier Mourlot and published in 1954. Size: 9 1/2 x 7 1/4 inches. Signed in the plate (not by hand). 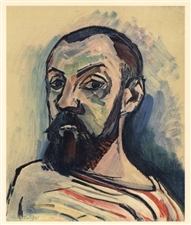 Henri Matisse lithograph "Self Portrait - The Seaman's Jersey"
At Affordable Art 101, you’ll find a vast array of original Matisse linocuts and lithographs and other Matisse prints. Some of the original Matisse prints we offer are created from his early cutouts and drawings, including the highly sought after La Danse, or the Dance, lithographs with pochoir coloring by Matisse. Whether you’re a print collector or simply an art enthusiast looking for artwork by Matisse, thank you for browsing at Affordable Art 101 online.